Malta comprises an archipelago of seven islands in the Mediterranean Sea, with the beautiful Comino island and stunning Valletta Waterfront among the highlights for tourists. Roughly 450,000 British tourists visit Malta every year, which is accessible by airplane, ferry or car from the United Kingdom. 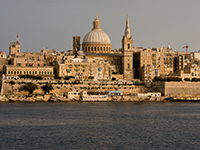 Flying from London to Valletta, the capital of Malta, can take just over three hours for non-stop travel, which rises to between four and five hours if a stop is included. Malta can also be accessed from the UK by ferry, which takes you through Paris and Milan on day one, before a high-speed train from Rome connects you to Malta on the second day. A similar route can also be undertaken for those looking to drive, although travellers should expect a journey time of between 31 and 33 hours. If you are unsure as to managing your diabetes while travelling to Malta, you should consult a member of your diabetes team. Malta is one hour ahead of British Summer Time and two hours ahead of Greenwich Mean Time. This should not necessitate any major changes to your diabetes management. The average climate in Malta is comparatively warmer than the UK, with average high temperatures in Valleta summers regularly around 28°C. Winters are also much more enjoyable, with average temperatures between 13-15°C. Insulin takers should be wary as insulin can be absorbed faster in warmer temperatures. This will require attentive checking of blood glucose levels. You could consider reducing dosages if planning periods of physical activity in the sun and you are concerned about hypoglycemia. The currency in Malta is the Euro. However, the majority of hotels, larger shops and restaurants also accept payment in the main international currencies such as sterling and dollars. A yellow fever vaccine is required from all travellers entering Malta from a country where yellow fever is prevalent. Otherwise, this vaccine is not recommended. There are no mandatory vaccinations required to enter Malta, however rabies is present in bats in Malta, so it is advised for those planning activities in remote areas that put them at risk for bat bites to receive a rabies vaccine. Malta is amongst the European countries that allow you to receive state healthcare either at a reduced cost or sometimes for free. It will cover you for medical treatment until you return to the UK. Medication is available in Malta, but payment is required from a pharmacy. However, possessing an EHIC card allows you to receive treatment at a lesser cost and this money can be recouped when you get back into the UK. Most pharmacies in Malta are open from 09:00-13:00 on weekdays, before reopening after lunch from 16:00-19:00. On Saturdays, pharmacies will open on mornings between 09:00-12:00, with pharmacies then shut on Sundays. lood and urine testing kits are available from many pharmacies in Malta. The emergency services telephone number to be called in Malta is 112. You should note which syringes are available in Malta, with U-100, U-80 and U-40 syringes the most commonly used. How is blood glucose measured in Malta? Unfortunately, we do not have the information of whether blood glucose is measured in mg/dl or mmol/l in Malta.